It’s the era of reboots and revivals, from Will & Grace to Charmed. One huge proponent of this era of TV is talk show host and comedian Ellen DeGeneres, who couldn’t help asking former Parks and Recreation stars and current Making It cohosts Amy Poehler and Nick Offerman about rebooting their well-loved comedy series when they appeared on her show on May 24. After DeGeneres showed the audience shirtless photos of Offerman, as is traditional for first-time guests of the show, she asked the actors about how they met. Poehler said she met Offerman in the early ’90s “at a house party in Chicago. I was doing improv at the time and Nick was in experimental theater… and he was really scary looking, because you can look quite scary, even though you have the heart of an angel,” she said, turning toward Offerman. The conversation turned to Parks and Recreation, which aired on NBC from 2009 to 2015. According to Entertainment Weekly, the cast has kept in touch since the series wrapped, and it’s really clear how much they all love each other. DeGeneres mentioned Offerman’s wife, comedian Megan Mullally, who this year reprised her role as Karen on the Will & Grace reboot, and asked about the possibility of a return to Pawnee. Offerman quipped, “We just had a fitting earlier. We said that if Beyoncé would play the mayor, we’ll bring the show back. This is Beyoncé Knowles, the singer, the entertainer.” He also said that Poehler is the boss, and Poehler is all for it. “I’ll speak for everybody and say we would all do it. I think we’d all do it someday, it’d be amazing,” Poehler said. 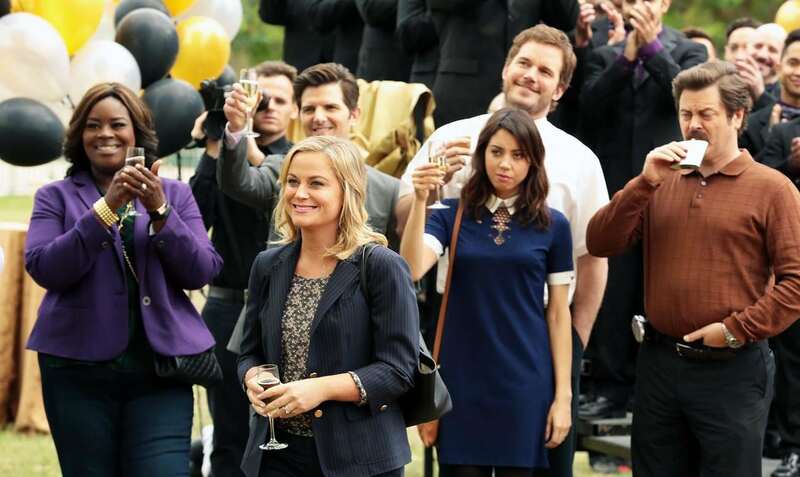 Parks and Recreation had seven seasons, and the last one took place after a three-year jump into the future. We saw the characters’ futures totally spelled out, including marriages, new jobs and families, and 13 episodes didn’t feel like enough. A revival would certainly do well, especially in the current TV climate… and it looks like the cast (or at least Poehler and Offerman) are all for it. Will it ever happen? We hope so!